The Cambridge Heart stress test monitor offers an intuitive, easy to operate user interface so you will never miss a beat – literally! Using the large, clear display, you can make your diagnoses from the screen with the Cambridge Heart stress monitor. Included with this product, is a swivel-tilt color screen, as well as an option for a strip chart recorder or laser printer. 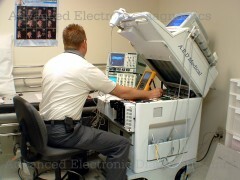 Additional features and benefits of the Cambridge Heart stress test system include, but are not limited to, the following: ·Our Cambridge Heart stress test monitor is Patient-ready · Customizable stress test protocols · Zero-distortion linear baseline stabilization filter · Full disclosure and comprehensive documentation · Interfaces with stress echo systems, treadmills, and bicycle ergometers.